Make this cute little fish with your little ones using items that can be found in most homes. 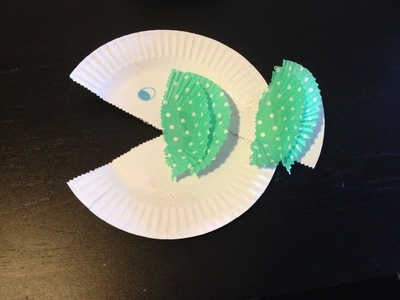 Turn the paper plate over and draw the fish's mouth with a pen. See the photo below for a guide. The mouth doesn't need to go all the way to the centre if you don't want it to, but what you cut out becomes the tail so make sure what you mark is a good mouth and tail. Cut along the lines to make the fish's mouth. You can use fancy scissors if you like. Pinking shears will give the fish some teeth! Glue the cutout "triangle" to the plate to form the fish's tail as in the picture below. Flatten at least one patty pan and cut it in half. The fish in the pictures has used two. Glue the half patty pans to the fish, coloured side up, to form the fins and tail. If you only put glue on what would have been the inside bottom of the patty pan, the rest of the patty pan can be flicked up to give a 3D feel to the fins and tail. Use a pen to give the fish an eye.